EUROCOM X7200 Panther 2.0 is the world’s first notebook with an HDMI 1.4 Input port! 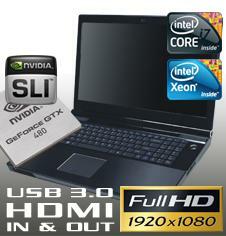 Eurocom is the world’s first notebook manufacturer to offer an HDMI 1.4 Input port in a notebook. Eurocom is currently offering HDMI 1.4 I/O port in the new Panther 2.0 Mobile Workstation. HDMI 1.4 is an upgrade in high definition multimedia interface technology. HDMI is a compact audio/video interface for transmitting uncompressed digital data. The Panther 2.0 is a revolutionary computing machine. With many high performance features the EUROCOM Panther 2.0 can be used as a Mobile Professional Workstation, Mobile Server and Gaming Station. It is customizable with a variety of features to make it ideal for a wide range of uses. With 6 core Intel i7-980X Extreme or Xeon 5600 Series processors the Panther 2.0 has serious computing power. The Panther 2.0 has a wide range of modular VGA solutions including NVIDIA GeForce GTX 480M, GTX 470M or GTX 460M single or dual/SLI operation and Quadro FX series cards. EUROCOM Panther 2.0 is designed to be the ideal workstation for professional users who demand the ultimate in portable performance. It supports up to 3.25TB of storage in 4 physical hard drives in RAID 0/1/5/10 and up to 24GB of triple-channel DDR3-1600 memory with Intel's XTU (eXtreme Tuning Utility) and XMP (eXtreme Memory Profile) functions. A major innovation with the Panther 2.0 is the introduction of an HDMI 1.4 input port, making the Panther 2.0 the first to have this feature. Having HDMI 1.4 in and out ports increases the functionality of the Panther 2.0 exponentially. Now it can be used for many Video and Audio production, editing, recording and viewing purposes. HDMI has always been a great interface for the high speed transfer and streaming of video. - Transfers video in 3D. HDMI 1.4 supports several stereoscopic 3D formats including field alternative (interlaced), frame packing (a full resolution top-bottom format), line alternative full, side-by-side half, side-by-side full, 2D + depth, and 2D + depth + graphics + graphics depth. - HDMI 1.4 incorporates a dedicated Ethernet Channel enabling high speed, bi-directional networking at up to 100 Mb/sec. This consolidates video, audio and data in a single cable. - HDMI 1.4 has added an Audio Return Channel which enables a device to send audio data upstream to an A/V receiver, thus eliminating the need for an S/PDIF audio connection. LipSync functionality ensures the audio stays in sync with the video. - Transfers video in 4k x 2k Resolution (4096x2160p24). This adds support for extremely high video resolutions, 4000 lines wide by 2000 lines high. Putting your home theatre system on par with cinema projectors. - HDMI 1.4 introduces a new micro connector for small portable devices, which allows cell phones, cameras and other small devices the ability to transfer video just like any other video device. Many other manufacturers have included HDMI output ports on their Workstations in the past. However, Eurocom is the first to provide both HDMI out and HDMI in 1.4 ports in EUROCOM Panther 2.0 and offer this via Modular HDMI interface allowing for upgradeability to future HDMI standards and ensures a long lifespan of the notebook. Video production companies can now utilize the EUROCOM Panther 2.0 as a mobile video production machine that can absorb high quality video input, edit and produce the video and then output the video to a secondary video viewing or storage device. News stations can utilize the Panther 2.0 as a mobile production station; the content can be filmed and uploaded to the Panther 2.0 for editing all while off site. Gaming developers have expressed demand for the Panther 2.0 so they can use it as an all in one system for creating, testing and viewing of their games. External gaming consoles can be connected to the Panther 2.0 via the HDMI 1.4 input port for viewing on the high quality LED backlit display. Gaming consoles can be connected to the EUROCOM Panther 2.0 for display on the massive 17.3 inch monitor. Now gamers have a portable machine that can be used for PC gaming and console gaming. With the HDMI input port the EUROCOM Panther 2.0 can be used as a home entertainment console. It can be connected to a cable or satellite box for viewing or PVR duties, while also being connected to a surround sound audio system via the Audio Return Channel. Users now have a mobile home entertainment system. Connect a Blu-Ray player to the Panther 2.0 for high definition video viewing. Businesses now have a mobile video conferencing solution that can input or output high resolution video.